Lefty ace of the staff that led the Yankees through their dynasty years of the 1950's and nicknamed "The Chairman of the Board," Ford won the Cy Young Award in 1961 and established a World Series career record by winning 10 games in the Fall Classic. His lifetime record of 236-106 gives him the best percentage (.690) of any 20th Century pitcher. 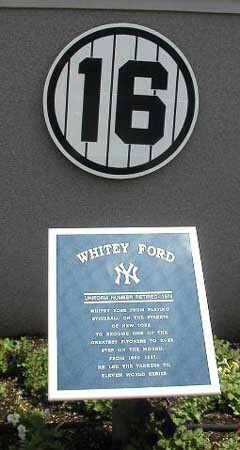 The Yankees retired his number 16 in 1974.